This article is intended to make it easy to build a penetration test environment without complicated settings if Docker and Kubernetes are introduced. All things to use this time are in GitHub and Docker Hub . Since GitHub also has a Dockerfile of Metasploit images etc., please remodel it so that it is easy to use. Let's get the things we need by executing the commands below in order. Now that you have got what you need, let's move it. 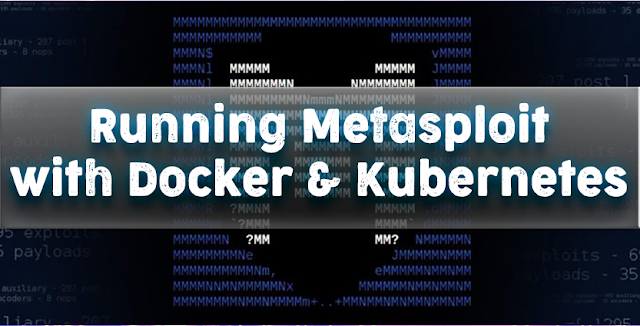 $ docker run --rm -it tleemcjr/metasploitable2:latest sh -c "/bin/services.sh && bash"
# The IP address is required when specifying an attack target later, so record it. # Enter Ctrl-p, Ctrl-q to leave the container while moving, and check if the container is moving with the following command. This completes the environment construction using Docker. Also, this time, an --rm option is added at the time of execution so that extra containers do not remain . Here, let's actually carry out a penetration test using Docker. Since you are currently logged in to the attack container, msfconsole entering the command will launch the Metasploit console.
.: okOOOkdc '' cdkOOoko :. .OOOOOOOO. . ;            ;     , OOOOOOOO. This time, I would like to proceed in the following order. First, let's check if the Metasploit is connected to the database. Since the Docker image used this time is connected to the database from the beginning, it should be output like the above. Let's store the result in a database by applying Nmap to Metasploitable. [*] Nmap: Host is up (0.00054s latency). [*] Nmap: |_ssl-date: 2019-01-25T08:58:24+00:00; 0s from scanner time. [*] Nmap: 1524/tcp open  ingreslock? [*] Nmap: Service detection performed. Please report any incorrect results at https://nmap.org/submit/ . -A It takes quite some time because you are using options, but please be patient. You now know a variety of information, such as available ports, services and OSs that are likely to be running there. By the way, since these are naturally stored in the database of the container currently logged in, you can also view the information by sending a query from SQL. By storing the result of Nmap in the database in this way, it is possible to import it during automation and export the result. In addition, when there are multiple entries in the database, hostsyou can also select an attack target that meets the conditions by using a command or the like. Now DEPRECATED it has become, but there is db_autopwna plug-in for automatic attack called Metasploit . db_autopwn Is an excellent way to attack automatically with information obtained from the database about the attack target. Even in Docker image you are using this time db_autopwn you Yes is set to use the ( load db_autopwn and db_autopwn <option> can be used by running the two commands) is, for true vulnerability is too much,Here is a description of the resource file that can automate the console. This seems to be something that automates the task by writing the task which is done many times in the resource file. Furthermore, ~/.msf4/ if you put resource files below, it will execute the contents each time you call the console. This time I do not particularly attack many times, but I think that you can use it with Kubernetes, which will be described later, so I would like to attack using resource files. Also, as we know from Nmap results that the ftp service is running on port 21, we will use the famous module for ftp this time. sessions -i 1 -c "id"
sessions -i 1 -c "pwd"
sessions -i 1 -c "echo \"You've been hacked\" > /hacked.txt"
This is the only thing that writes to resource files. Only the module used and the target IP and execution instruction of the attack. By the way, in the sessions command part, you can specify an instruction which you want to execute as an -i option for any session -c.
Let's run this resource file from Metasploit. [*] Processing easy_pentes.rc for ERB directives. [*] 172.17.0.2:21 - USER: 331 Please specify the password. [*] Session 1 created in the background. resource (easy_pentes.rc)> sessions -i 1 -c "id"
resource (easy_pentes.rc)> sessions -i 1 -c "pwd"
resource (easy_pentes.rc)> sessions -i 1 -c "echo \"You've been hacked\" > /hacked.txt"
It seems that I was able to attack safely. It can be confirmed that this attack has gained root privileges. Also, the directory at the time of the successful attack / seems to be the top . You can also load resource files by adding options to the msfconsole command and -r turn -q off the banner by adding options. Let's confirm from the Metasploitable side that the attack was successful. Please log in to Metasploitable. The hacked.txt directory I wrote above / should have been written, so it should not be necessary to move the directory in particular. It was confirmed from the Metasploitable side that it was infringed. The penetration test using Docker is above. This time, I wanted to create many Metasploit Pods and Metasploitable Pods easily, so I used the ReplicaSet resource. By default, one Metasploit Pod and three Metasploitable Pods are created, but you can spec.replicas create as many verification environments as you like by changing the fields of each YAML file . Let's check if we can communicate with other pods by entering one of the above pods. PING 172.17.0.6 (172.17.0.6) 56(84) bytes of data. You seem to be able to communicate safely. This completes the environment construction using Kubernetes. Kubernetes can perform penetration tests in the same way as Docker showed. That's it. Thank you for reading so far!